My dear brothers and sisters, my subject today is building homes and families that are spiritually secure. “Of the 65 million Americans under 18, [many] live in poverty, 22% live in single-parent homes, and almost 3% live with no parent at all. Violence among the young is … rampant. … Playground fights that used to end in bloody noses now end in [some fatalities]. Schools that once considered talking in class a capital offense are routinely [checking children] for weapons, questioning them about drugs. … A good public education, safe streets, and family dinners﻿—with both father and mother present﻿—seem like quaint memories of a far distant past. … The parents of nearly 2,750 children separate or divorce each day. … Every day over 500 children ages 10 to 14 begin using illegal drugs, and over 1,000 start drinking alcohol. Nearly half of all middle-schoolers abuse drugs or alcohol or [become involved in immorality].”2 Data from other nations are equally alarming. These and many other ills of our society today have their source in the breakdown of the family. If Satan can weaken or destroy the loving relationships among members of families, he can cause more misery and more unhappiness for more people than he could in any other way. The place to cure most of the ills of society is in the homes of the people. Building our homes as fortresses of righteousness for protection from the world takes constant labor and diligence. Membership in the Church is no guarantee of a strong, happy family. Often parents feel overwhelmed. Many must accomplish the whole job single-handedly while bearing all of the emotional pain of divorce. The Lord has provided a plan that will help us to be successful in meeting every challenge that may confront us. In the plan of salvation, all families are precious instruments in the Lord’s hands to help direct His children toward a celestial destination. The righteous molding of an immortal soul is the highest work we can do, and the home is the place to do it. To accomplish this eternal work, we should make our homes gospel centered. When peace and harmony abound, the Holy Spirit will ever be present. The storms of the evil one can be stopped at the very entrance of our homes. The Lord’s standards for building a temple apply also to building spiritual strength in our homes: “Organize yourselves; prepare every needful thing; and establish a house, even a house of prayer, a house of fasting, a house of faith, a house of learning, a house of glory, a house of order, a house of God.” (D&C 88:119.) Do we heed this counsel from the Lord? Do we do what He asks? We would do well to build our homes according to this plan or they are destined to fail. Our families should gather for family prayer morning and night. In addition, we should offer our own individual prayers for our personal needs. We can make each home a house of faith by believing in the goodness of God and believing that we can live gospel principles and live in peace and security. We need to have the faith to be obedient, to keep trying, and to keep a positive outlook. Sometimes we get discouraged and feel like giving up. But, as an old cowboy once said, “If I get bucked off, I must get back up on the horse and ride on.” We can never give up. Every home is a house of learning, either for good or otherwise. Family members may learn to be obedient, honest, industrious, self-reliant, and faithful in living gospel principles, or they may learn something else. Learning the gospel in the homes of Church members should be centered on the scriptures and on the words of latter-day prophets. A personal word of counsel to parents: Teach your children to pray, to rely on the Lord for guidance, and to express appreciation for their blessings. Children learn from you to distinguish between right and wrong. They learn that lying, cheating, stealing, or coveting possessions of others is wrong. Help them to learn to keep the Sabbath day holy and to pay their tithing. Teach them to learn and obey the commandments of God. Teach your young children to work, and teach them that honest labor develops dignity and self-respect. Help them to find pleasure in work and to feel the satisfaction that comes from a job well done. When I was a boy, our family home evening took place at the dinner table. It was most pleasant and enjoyable. It was a time when our father would reminisce and tell us about his life. He often told us of his inspirational and exciting experiences while preaching the gospel as a missionary in Germany. Each story seemed to improve the more often it was related. I grew up never doubting that I would become a missionary, and I never lost the zeal that he instilled in my heart. Our mother taught us about the nobility of her pioneer parents and their great faith in the gospel. Home can literally become a house of glory. Memories of early childhood can become significant in our daily lives. To instill order in our homes, parents should be in charge and exercise parental authority in righteous dominion and establish acceptable standards of behavior for their children, setting limits and adhering to them consistently. They are to teach and guide their children “by persuasion, by long-suffering, by gentleness and meekness, and by love unfeigned; by kindness, … reproving betimes with sharpness, when moved upon by the Holy Ghost; and then showing forth afterwards an increase of love.” (D&C 121:41–43.) Parents then will earn the respect of their children, and children will honor their parents, unifying families. Other safeguards of order in our homes include assuring that children are blessed, baptized, and sons ordained to the priesthood. In addition, they should be worthy to enter the holy temples, become missionaries, and receive the crowning blessing of an eternal marriage. My brothers and sisters, if you will make your home a house of prayer and fasting, faith, learning and glory, and order, it can become a house of God. If you build your homes on the foundation rock of our Redeemer and the gospel, they can be sanctuaries where your families can be sheltered from the raging storms of life. I testify of the divinity of the Savior, Jesus Christ, the Son of God. We are the spiritual offspring of our Heavenly Father. He is mindful of each one of us and wants our homes and our families to be spiritually strong. Joseph Smith is a true prophet of God, as are all of his successors, including President Ezra Taft Benson. In the name of Jesus Christ, amen. Unpublished manuscript, Winnipeg Manitoba Stake conference, 27 Oct. 1990. Louis S. Richman, “Struggling to Save Our Kids,” Fortune, 10 Aug. 1992, pp. 34–35. Gospel Doctrine: Selections fromt the Sermons and Writings of Joseph F. Smith (Salt Lake City: Deseret Book Co., 1939), p. 302. James R. Clark, comp., Messages of the First Presidency of The Church of Jesus Christ of Latter-day Saints, 6 vols. (Salt Lake City: Bookcraft, 1970), 4:339. Family Home Evening Manual (Salt Lake City: The Council of the Twelve Apostles of The Church of Jesus Christ of Latter-day Saints, 1965), p. iii. Family Home Evening Manual (Salt Lake City: The Church of Jesus Christ of Latter-day Saints, 1976), p. 3. Joseph L. Wirthlin, A Heritage of Faith, comp. 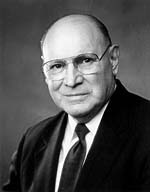 Richard B. Wirthlin (Salt Lake City: Deseret Book Co., 1964), pp. 42–43.